When a Libyan terrorist group called the Hand of God are running around killing politicians, detectives Neil Farrow (Harrod) and Bill Marshall (Everett) are on the case. Captain Burton (Estevez) is constantly demanding answers from them, and after Marshall ends up in a coma, Farrow goes rogue – and also goes to Texas – to find the perpetrators. While somewhat of a fish out of water in the small town of Morgan County, Texas, Farrow has a spirit guide – his comatose partner Marshall himself! Dressed in a white T-shirt and bathed in white light even though he’s not dead, he gives Farrow cryptic clues as to what to do next. Doubtlessly it’s because of this intervention that Farrow comes across local powermad good ol’ boy Milo Truscott (Patterson) and his gang of nogoodniks. After traveling to the local “survival camp” and being mercilessly mocked and ridiculed by the local doomsday preppers, Farrow decides enough is enough and takes the law into his own hands to unravel the mystery. But will there be BLOOD ON THE BADGE? 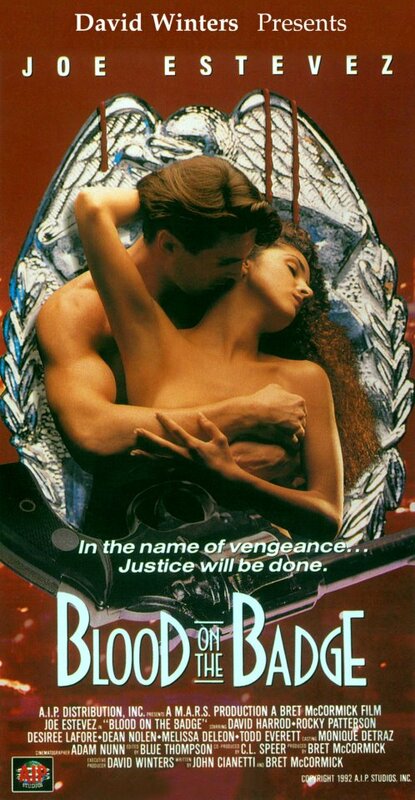 Shot the same year as Armed For Action (1992) and featuring almost the exact same cast and crew, Blood On The Badge is more low-budget, Texas-set, Joe Estevez-infused DTV wonderment. 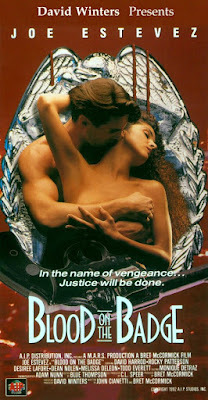 Out of the two, we prefer Armed For Action, mainly because that has a higher mullet-and-Gatling-gun ratio, but it’s probably a matter of taste. David Harrod returns as the hunky Himbo hero. His favorite outfit is what appears to be a homemade New York Yankees T-shirt tucked into acid washed jeans with a black belt. When he’s not wearing that, he likes to lounge around in a towel, showing off his ultra-manly Woody Woodpecker tattoo. He’s so much of a Himbo, he makes Dan Cortese look like William F. Buckley. Naturally, the ladies can’t get enough of him, and that includes Monique Detraz of The Dangerous (1995) fame. While the movie as a whole suffers from pacing issues, Joe Estevez appears right on time. Rocky Patterson also returns, along with everyone else, from Armed For Action. In that outing he strongly resembled Joe Piscopo. In this movie, he strongly resembles Greg Kinnear. The man is a true chameleon. While his name here is Truscott, it sounds like everyone is calling him “Triscuit”. Thankfully, this movie isn’t quite as dry as his namesake cracker. Speaking of which, Truscott is a racist bigot who spews racial slurs constantly. That and the sax on the soundtrack are the hallmarks of a type of film which is not made anymore. While in many respects, Blood on the Badge is a relic of its day, it is actually quite ahead of its time. The plot revolves around Islamic terrorists, and there is a subplot that involves the Israeli ambassador. They should re-release this back into theaters today. While there are a healthy amount of funny lines and silly situations, the plot is slow going. 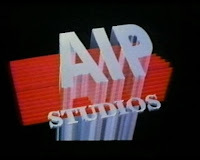 There is a machine gun shootout in a warehouse, and even an exploding helicopter, so in that respect it’s pure AIP. It all ends on a classic freeze frame and under the closing credits are wedding pictures. You’ve gotta hand it to director McCormick and his band of regulars. It may be rough around the edges, but, darn it, he made these movies and released them into video stores. You can tell plenty of effort was put into making them as good as possible under very, very limiting circumstances. It’s probably important to keep that in mind while watching. In the end, if you liked Armed For Action, or even One Man War (1990), and you appreciate that down-home style, you’ll more than likely enjoy Blood On the Badge. If not, you probably won’t, though it is just entertaining enough to satisfy VHS junkies who are familiar with this type of material.